The condition has many possible causes, such as autoimmune disease. Other diseases or infections may also be the cause. Symptoms can include dark brown urine, less urine and low energy. Treatment may include changes in diet, medicines or dialysis. The symptoms of glomerulonephritis can be like other health conditions. Make sure your child sees his or her health care provider for a diagnosis. Most children with kidney disease see both a pediatrician or family doctor and a nephrologist. A nephrologist is a health care provider with special training to treat kidney problems. Treatment will depend on your child’s symptoms, age and general health. It will also depend on how severe the condition is, and the cause. Treatments focus on slowing the progression of the disease and preventing complications. Talk with your child’s healthcare provider about the possibility of working with a pediatric dietician to help manage your child’s nutritional care. This can be done at home. This method uses the lining of the belly (abdominal) cavity to filter the blood. This cavity is the space that holds organs such as the stomach, intestines and liver. The lining is called the peritoneum. First, a surgeon places a thin, flexible tube (catheter) into your child’s belly. After the tube is placed, a sterile cleansing fluid (dialysate) is put through the catheter into the peritoneal cavity. The fluid is left in the belly for a period of time. This fluid absorbs the waste products through the peritoneum. The fluid is then drained from the belly, measured and discarded. This process of filling and draining fluid is called an exchange. This is done in a dialysis center or hospital by health care providers. A special type of access, called an arteriovenous (AV) fistula, is placed during a small surgery. This fistula is an artery and a vein that are joined together. It is usually done in your child's arm. An external IV (intravenous) catheter may also be inserted. This is less common for long-term dialysis. Hemodialysis is usually done several times a week. Each session lasts from four to five hours. It may be helpful to bring games or reading materials for your child to keep him or her busy during this procedure. Talk with your child’s health care providers about the risks, benefits and possible side effects of all treatments. The Kidney Transplantation Program is the only one of its kind in the Washington, D.C., area focused on the needs of children and teens with kidney disease. Additionally, it is the region's only Medicare-approved center for kidney transplants in children and teens. 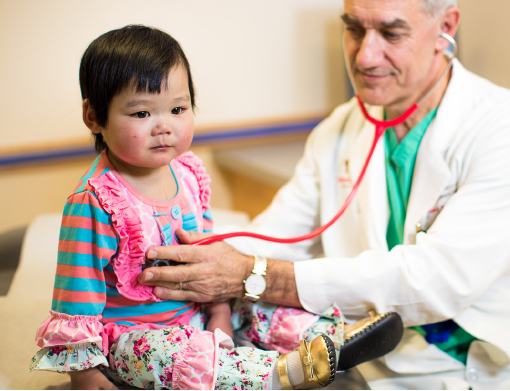 Learn how our highly skilled team works across divisions to treat kidney disease in children. Children’s National provides a healthcare experience designed with kids in mind, and delivers confidence and assurance when parents need it most. We provide a wide range of clinical services and specialties dedicated to improving children’s health. The three-year program provides excellent opportunities to help fellows develop and refine the skills necessary to become a well-trained pediatric nephrologist and an accomplished investigator in the area of clinical and/or basic science.